Bat Week 2017 has come to an end. We had daily social media posts to put bats in the figurative spotlight. Below are all these posts bundled together for ease of access. 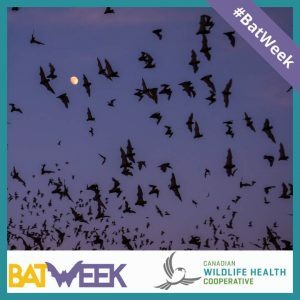 Check out www.batweek.org to learn about the importance of bats. 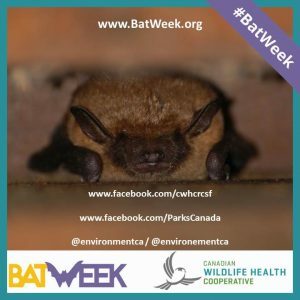 Keep your eye on the CWHC facebook page, the Bat Week facebook page, and our Canadian partners – Parks Canada and Environment and Climate Change Canada’s facebook pages this week to get your daily dose of bat facts. Bats are providing invaluable services to our ecosystem and our economy. 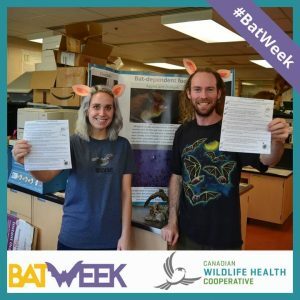 What are you doing to help bats in return? 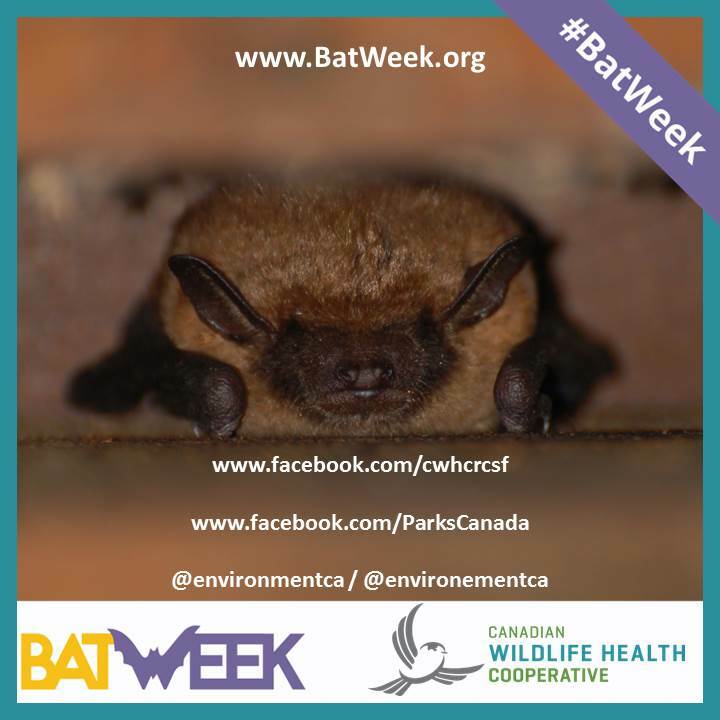 All bats in Canada are insectivores. Every night in spring, summer, and fall they eat large amounts of insects that are agricultural pests, thus acting as a natural pest control. This saves Canada a lot of money and gives us apples, grapes, and other fruits, vegetables and nuts at an affordable price. 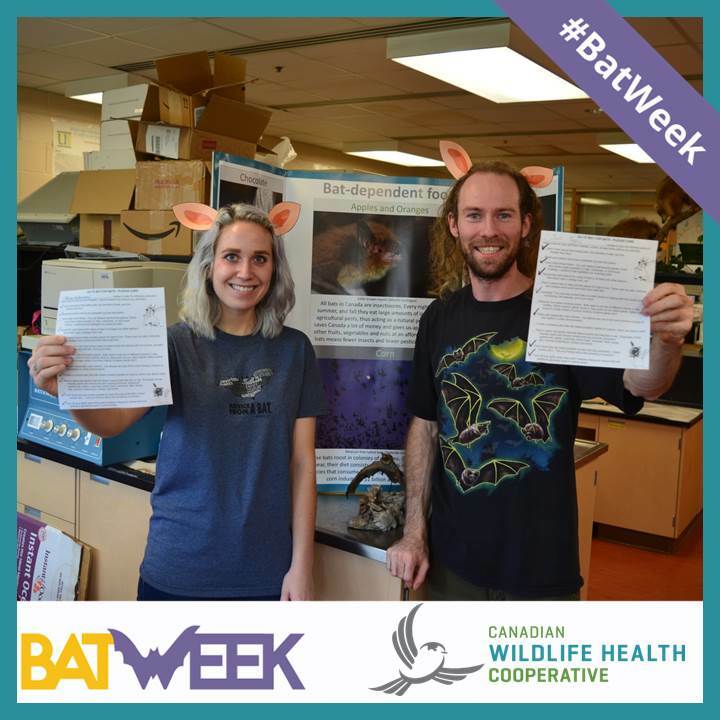 More bats means fewer insects and fewer pesticides on our crops. 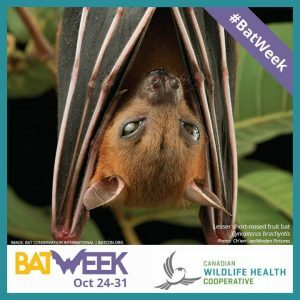 What are you doing to help bats? Show others what you intend to do (or are already doing) by signing the pledge. This is a great way to motive people around you to take action to help bats. Mexican free-tailed bats roost in colonies of millions. Depending on the time of year, their diet consists of 30 to 90% moths, including moth species that consume corn. 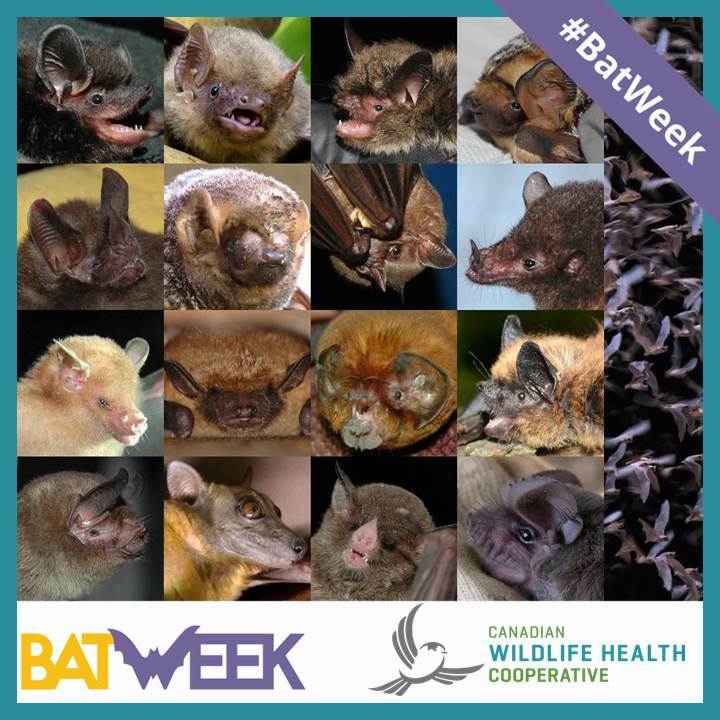 The estimated value of bats to the corn industry is $1 billion annually worldwide! Fruit bats all around the world are important seed dispersers of avocados, mangoes, papaya, bananas, and more. Some tropical forests would not exist if It wasn’t for bats. 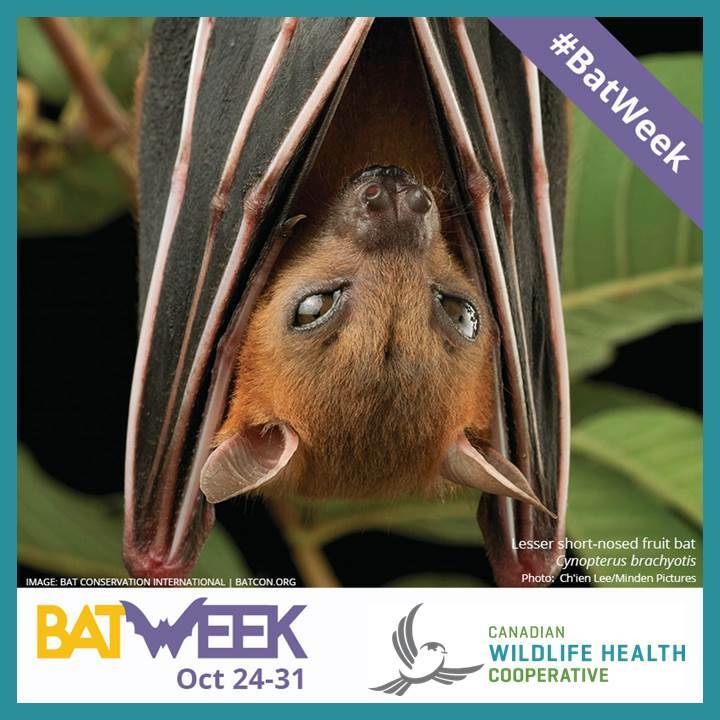 Check out the Bat Week cookbook for recipes made with bat-dependent ingredients. 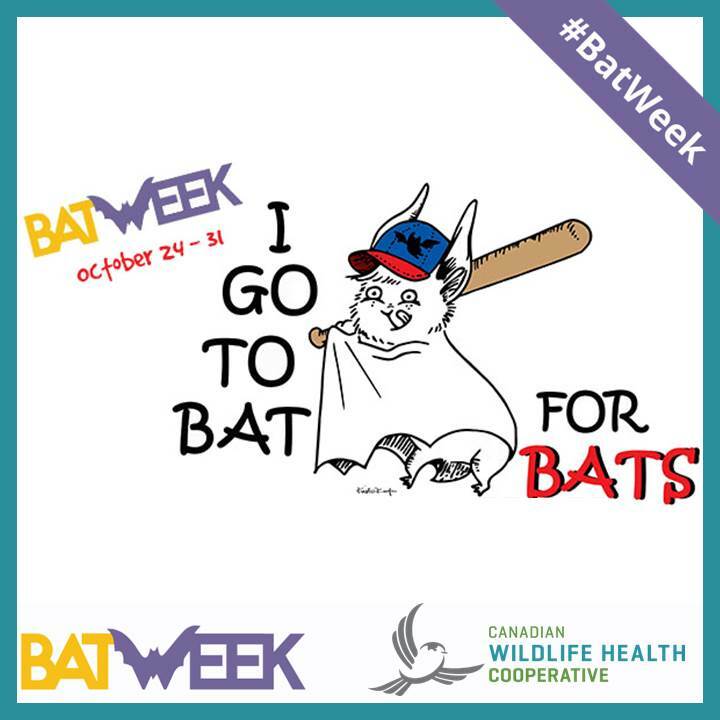 You’ll be amazed by all the food that we have bats to thank for. Bats are still highly misunderstood animals. Especially on a day like today people think about bats as scary vampires. 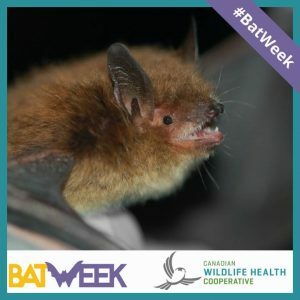 While vampire bats do exist, they do not live in Canada and generally only take a little bit of blood from live-stock and wild animals (they don’t kill these animals). Did you know that vampire bats feed each other to make sure the whole colony remains healthy? There is much to be learned from their kindness. 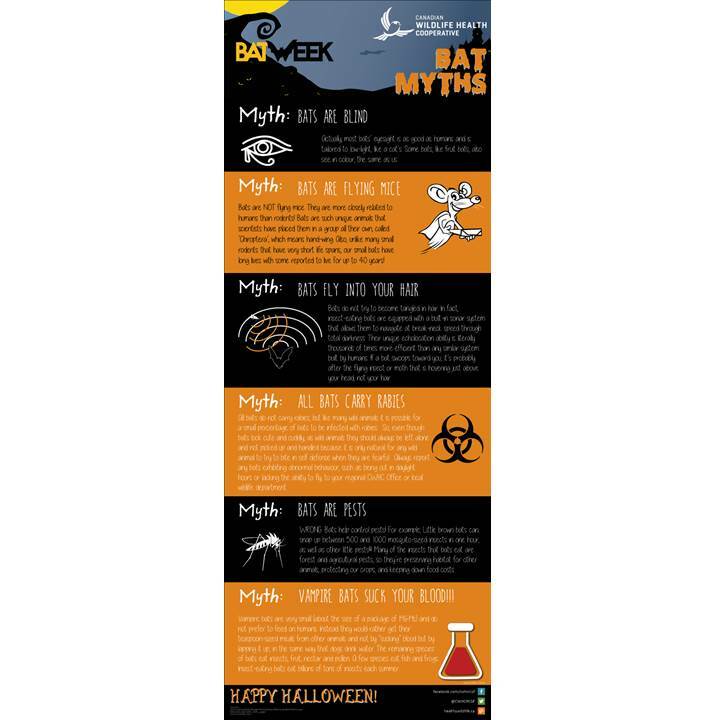 Here are some more myths on bats that we want to see busted. 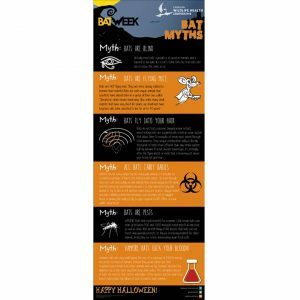 Happy Halloween and happy last day of Bat Week. Cheers to the bats. Next story A study of the raccoon roundworm in Ontario. It’s a trap!